It is common for women to experience mood swings during their lives. 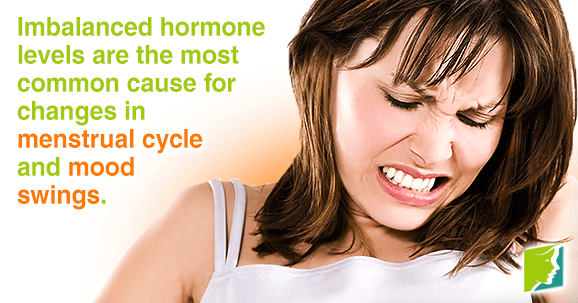 During a women's menstrual cycle, however, fluctuating hormone levels can increase ones susceptibility to the sensation. This is because hormone fluctuations can seriously impact the brains serotonin levels and consequently rock a woman's emotional stability. Because mood swings are unpredictable by nature and variable in severity, they can be hard to manage. However, mood swings can also be triggered or intensified by other lifestyle factors and habits. Stressful circumstances or activities can precipitate mood swings or menopause symptoms can also have a significant impact. Mood swings are sudden alterations to a person's emotional equilibrium. These emotional fluctuations can occur at any time seemingly without any significant cause or they can be a disproportionate reaction to an otherwise insignificant situation. It is common for women to not understand what exactly has caused their mood shift or to be unsure about how to react. Many factors influence a woman's emotional well-being and in order to effectively deal with menstrual cycle mood swings, it is worth understanding the various triggers. It is generally accepted that mood swings are largely triggered by physical causes, especially in relation to menstruation. A woman's monthly cycle for example, is considered as the physical trigger responsible for offsetting hormone induced mood swings. The sensation occurs because just before a woman's period, a reduction in estrogen and progesterone affects the brain's neurotransmitters regulation and causes mood swings. Mood swings can also be triggered by pre-existing conditions such as sleep apnea, insomnia, and lupus. Additionally, everyday life stresses and fatigue can also elicit emotional instability. Mood swings might also be brought about by external factors such as alcohol, caffeine, and stimulants such as sugar. Consider counselling if you feel depressed or emotional for extended periods. Cognitive behavioral therapy (CBT) are designed to help solve problems such as mood swings, anxiety, and depression. Although medication can be prescribed in cases of severe emotional difficulties, this is generally a last resort. Birth control pills can also be used to regulate mood swings and other symptoms of premenstrual syndrome (PMS). Each individual situation however, must be discussed with a doctor. Follow the links to learn more about the treatments for menstrual cycle changes and mood swings. Molecular Psychiatry.(n.d). "Estrogen Promotes Gender Difference in Brain's Response to Stress". Molecular Psychiatry. Retrieved from www.psycheducation.org. Alcohol can affect women differently. Alcohol can affect your mood by promoting feelings of sadness or aggression. Do not let your mood swings get the best of you. Although it can be impossible to avoid your hormonal fluctuations, there are ways to reduce them.